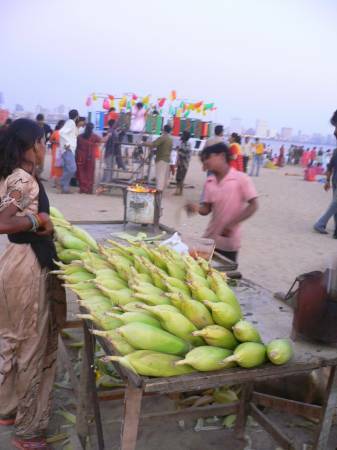 Known as 'bhutta' or 'Makkaai' in Hindi, corn is a summer time favorite. "Bhuttawallah's" or the corn vendor in India goes around the streets of Mumbai with his wooden cart stocked high with fresh bhuttas. He has a coal stove atop the wooden cart. The smell of the fresh roasted corns is so enticing that people start gathering at his cart picking and choosing the corn that they would like the "bhuttawallah" to roast for them. One has to open the husks and poke a few of the kernels, digging your sharp nails to see how fresh the corn is. Within 3 to 4 minutes with the perfect roasting technique your corn on the cob is ready. Now comes the "zesty part". With a freshly cut piece of lime, the bhuttawalla will dip the open end of the lime into a mixture of red chili powder and salt and then artfully massaged the length of the cob, leaving trails of hot and sour flavor all over the kernels.. Mix the salt and chili powder and set aside on a small plate. On a gas burner or hot grill, turn the heat to high. Take one corn on the cob and hold it an inch above the burner. Roast while turning all the time. Within 3 to 4 minutes you will hear a popping sound. Keep turning the corn on the cob cob over until the kernels acquire a brownish black color. With a freshly cut piece of lime, dip the open end of the lime into the mixture of red chili powder and salt and then massage the length of the cob with the lime, salt and red chili. This will leave trails of hot and sour flavor all over the kernels. Eat or Serve immediately.